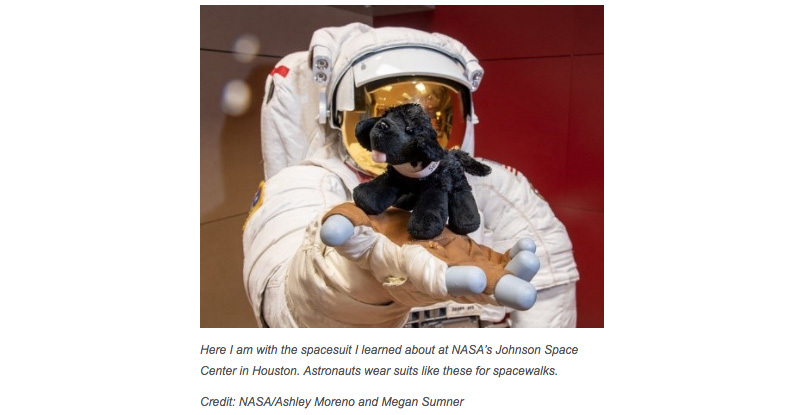 The National Park Service (NPS) and NASA have teamed up in a fun way to celebrate the 50th Anniversary of the National Trails Act and NASA’s 60th Anniversary by sending a plush toy representation of Seaman into space to the International Space Station (ISS). Seaman was Meriwether Lewis’ Newfoundland dog that accompanied him on the eponymous Lewis and Clark Expedition (1804-1806) as they blazed their way on a scientific expedition across the North American continent to the Pacific Ocean. Seaman Jr. began his journey into space on the CRS-15 flight to the ISS. Click to view my predawn time exposure of the CRS-15 launch with Seaman Jr. aboard. “The greatest traveler of my species” is blazing a new trail in space. 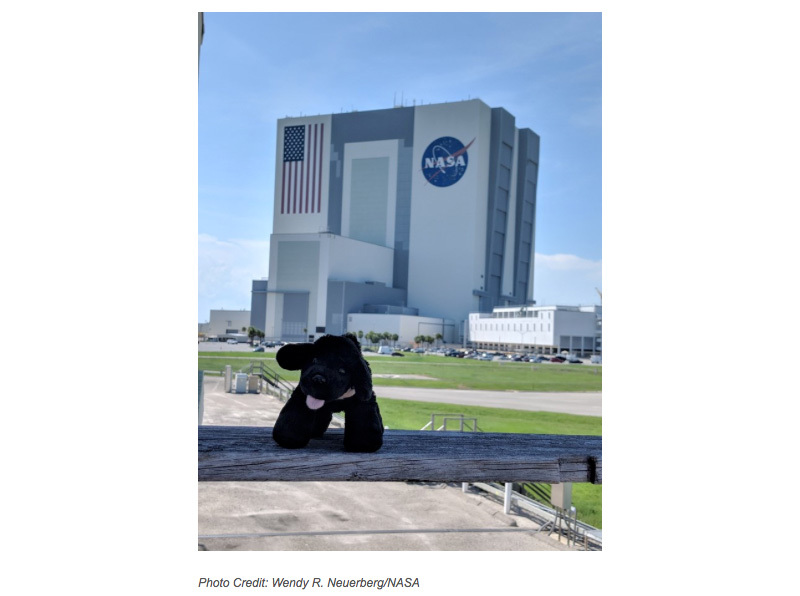 Seaman Jr., a plush toy, standing in for the original SEAMAN, the Newfoundland dog of Captain Meriwether Lewis, is headed to the International Space Station! In honor of the 50th anniversary of the National Trails Act and NASA’s 60th anniversary, Seaman Jr. will interact with astronauts and encourage others to learn more about their National Trails System. Like every astronaut who’s gone before me, I visited NASA’s Kennedy Space Center in Florida to practice climbing aboard before the actual launch. Here I am in front of the big Vehicle Assembly Building where they put together the Saturn V rockets that carried human astronauts to the Moon 50 years ago – and after that, all the space shuttles that ever flew! It’s the same place where NASA’s big new rocket for deep space exploration, the Space Launch System, will be assembled for its first flight around the Moon in the not-so-distant future. For my mission to the International Space Station, I launched on a different rocket, the commercial SpaceX Falcon 9, from nearby Cape Canaveral Air Force Station. Woof, fellow earthlings! This is Seaman Jr., writing from space! Right now, I’m aboard the International Space Station, a giant laboratory that circles the Earth at more than 17,000 miles per hour! Some said that a small and fuzzy toy like me could never be an astronaut, but I’m no ordinary stuffed animal. My journey to space started over 200 years ago, long before my time. You see, the original Seaman was the greatest canine explorer of all time. On the orders of President Thomas Jefferson, he trekked almost 8,000 miles through the wilderness with the Lewis and Clark expedition. The team travelled west for two long years, using science to study the animals, plants, weather, and landscapes along the way. While the explorers studied their surroundings, Seaman served cheerfully as a watchdog, hunter, and loyal friend. The expedition faced many dangers, including harsh winters, rugged terrain, and hostile animals. Luckily, they found lots of help along the way. Through teamwork with Sacagawea and other Native Americans, Seaman and his pals safely reached the Pacific Ocean in 1805! Looking down at America, I can see the route Seaman took, which is now called the Lewis and Clark National Historic Trail. It stretches all the way from Illinois to Oregon, but state borders aren’t visible from here. Instead, I see the vast forests, rivers, and mountains that Seaman bravely crossed before reaching the Pacific Ocean. 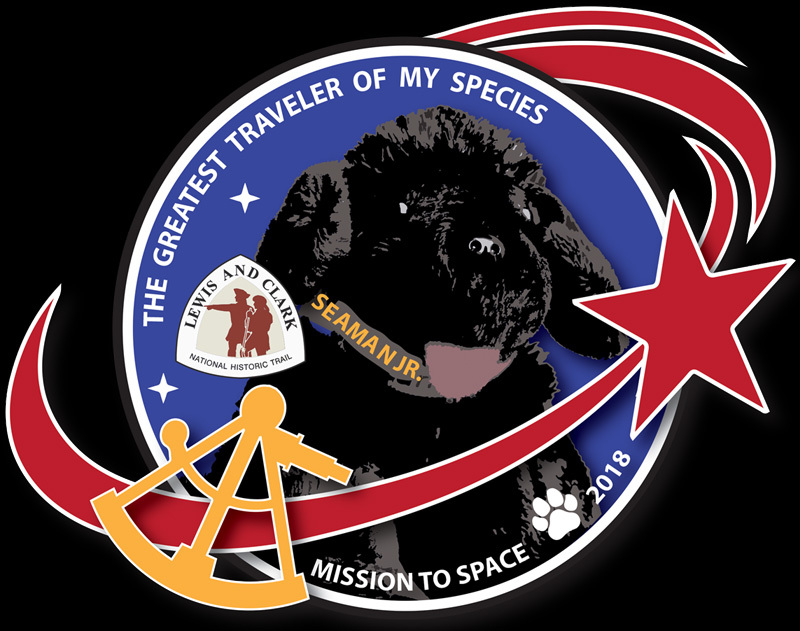 For his heroism, the original Seaman was given a collar that said, “The greatest traveler of my species.” Because we share a name, NASA thought I would also be brave, smart, and eager to serve with people from many cultures. That’s why they sent me to explore the next frontier: space! Now, as a pupstronaut, I’m working hard to prove myself worthy of the name Seaman Jr. Soon, I’ll be sending you more reports from space along with journal entries from my intense training at different NASA centers and other National Trails. Stay tuned, and keep exploring! 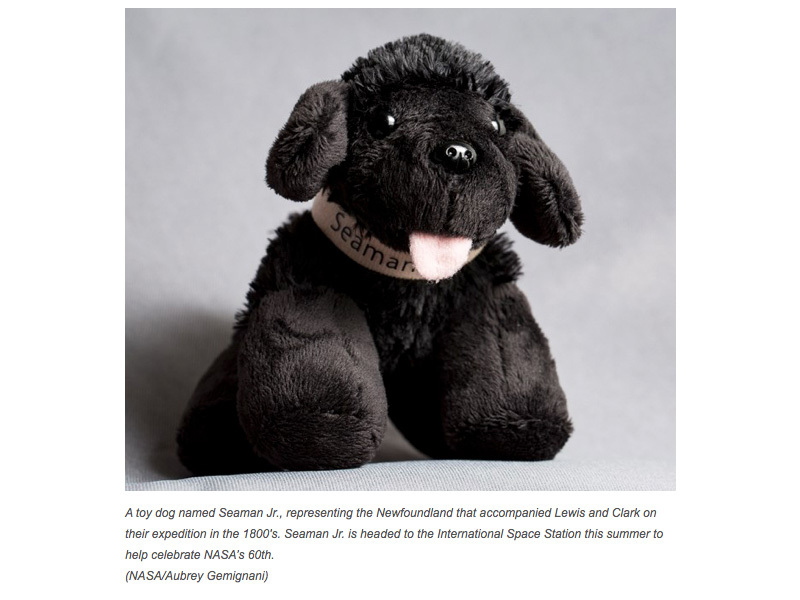 Seaman Jr. is a plush toy dog (small toy replica of “Seaman” — the Newfoundland working dog that accompanied Lewis and Clark) who will fly to the International Space Station during the summer and fall of 2018 on a mission to “commemorate and protect” the Lewis and Clark National Historic Trail. 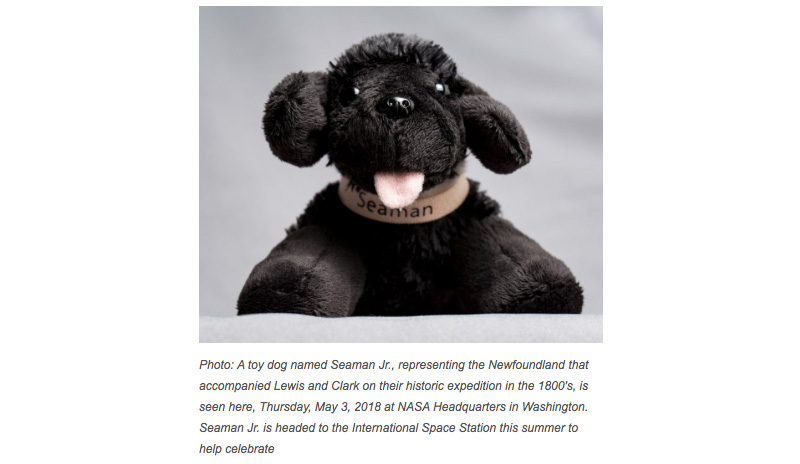 Seaman Jr. will join four other plush toy dogs that have been travelling the Lewis and Clark National Historic Trail this summer in honor of the 50th anniversary of the National Trails System. When will Seaman Jr. make his flight to the International Space Station and how long will he be aboard? Seaman Jr. is scheduled to fly on the CRS-15 Commercial Resupply Mission (target date June 29) to the International Space Station. During his time in space, he will interact with astronauts, survey the entire Lewis and Clark National Historic Trail and the National Trails System from space, and report back to his followers on earth. Seaman Jr. will be abroad the International Space Station through November 2018. Where can I follow Seaman Jr.’s travels? What is the Lewis and Clark National Historic Trail? The Lewis and Clark National Historic Trail is approximately 3,700 miles long, extending from Wood River, Illinois, to the mouth of the Columbia River, near present day Astoria, Oregon. It follows the historic outbound and inbound routes of the Lewis and Clark Expedition. The trail connects 11 states (Illinois, Missouri, Kansas, Nebraska, Iowa, South Dakota, North Dakota, Montana, Idaho, Washington, and Oregon) and many tribal lands. It is administered by the National Park Service. What is the purpose of the Lewis and Clark National Historic Trail? The purpose of the Lewis and Clark National Historic Trail is to commemorate the 1804 to 1806 Lewis and Clark Expedition through the identification; protection; interpretation; public use and enjoyment; and preservation of historic, cultural, and natural resources associated with the expedition and its place in U.S. and tribal history. The National Trails System consists of 30 national scenic and historic trails, as well as more than a thousand recognized regional or local national recreational trails and several side or connecting trails. The National Trails System traverses wilderness, rural, suburban and urban areas in all 50 states connecting with every distinct ecological area or biome in the US. They protect significant cultural resources, crucial conservation areas, and provide wildlife migration corridors, as well as education, recreation, & fitness for people of all ages. Over 230 million people live within 60 miles of a national trail. When is the anniversary of the National Trails System Act? The anniversary of the act is October 2. The National Trails System Act of 1968 established National Scenic Trails and National Recreation Trails and in 1978 President Carter signed into law a bill that created National Historic Trails. Why is the NPS and NASA sending Seaman Jr. into space? This project is being done to help mark anniversaries the two agencies are celebrating this year. The 50th anniversary of the National Trails Act is on Oct. 2, 1968, which coincides with NASA’s 60th anniversary on Oct. 1, 2018. Also, the 50th anniversary of Apollo 11 is July 2019 . Is this the first time the NPS and NASA have worked together like this? This is the first time the NPS has had an object go into space, but NPS (National Park Service) and NASA have a long standing working relationship. Why are the NPS and NASA partners? In settings of natural and cultural wonder many people gain deepened appreciation and understanding of the world around them and minds are opened to new ideas. Thus, parks are ideal locations for introducing people to science topics, and joining NASA’s unique science assets with the place-based experiences in National Parks provides visitors with highly meaningful, rich educational experiences. The goal of the NASA-NPS collaboration is public outreach and STEM engagement, providing a tangible connection between the explorers who opened American frontiers and the astronauts who are in space now helping to prepare future explorers to go to the Moon and Mars. What other projects have the NPS and NASA done together? NASA and the National Park Service (NPS) also have long standing collaborative efforts, working together and supporting each other in science, applied science, internships, astronaut speaking engagements, the total solar eclipse of 2017, and the Earth to Sky interagency partnership which works to join NASA and NPS science and education efforts through professional development and an associated community of practice. Is there anything special for kids to do with the NPS and NASA? The National Park Service has a national Junior Ranger Night Explorer Program, and Craters of the Moon National Monument and Preserve has a Become a Lunar Ranger program. Will there be more projects like this between the NPS and NASA? This is a pretty special opportunity to send something to the International Space Center, but one of the goals of the NASA-NPS Earth to Sky partnership is to assist in developing and promoting collaborative communication activities of the two agencies.The two agencies plan to continue this tradition of collaboration by highlighting and amplifying each other’s milestone anniversaries by collaborating on communications and outreach activities with exploration themes.